We wanted to create something functional for Cisco Spark, that could be of real use to people using Cisco Spark in a business context. We thought that people at large businesses, often with multiple offices, might need or want a quick way to translate text. With blood, sweat, and tears. We began basic bot implementations with Node.js and then built up to the integration of the Google Translate API. It works pretty well with most languages!! 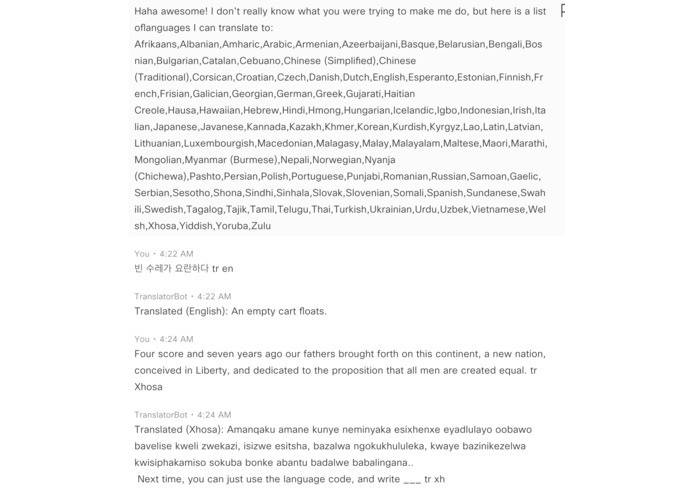 I worked on setting up the Google Translate API, as well as setting up the local server using ngrok. Integrated Google Cloud Translator API with Cisco Spark API using Node.js framework, debugging. Worked on setting the local communication servers and created the framework for the bot, as well as troubleshooted communication issues, integration of the cisco spark and google translate API's. Syntax corrections and debugging.